An explosion that rocked Petrobras’ second largest Brazilian refinery Sunday and left three people seriously burned has sparked work slowdowns amid growing safety concerns. The blast happened in the U-38 hydrogen generation unit at Petrobras’ 320,000 barrel per day Landulpho Alves Refinery (RLAM) and is the second accident at the refinery in a week. The injured workers were using an electric rotary sander on the inside of the hydrogen unit that had been drained earlier during the week when the explosion occurred. The unnamed workers sustained burns to between 10 percent to 75 percent of their bodies and have been hospitalized, Reuters said. Petrobras has not disclosed whether the blast will affect output at the refinery. A union representing workers at the plant staged a work slowdown set to last until sometime Tuesday morning to protest safety concerns at the refinery. The strike was not expected to significantly impact the refinery’s output. 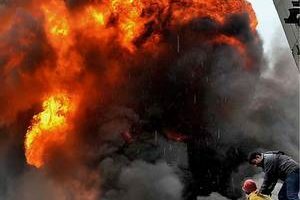 Last Wednesday, a fire broke out in the paraffin unit of the same refinery after a broken valve leaked kerosene. No injuries were reported during that incident. “It is our feeling that most of Petrobras’ refineries are not operating as safely as they should be,” head of Brazil’s national oil worker federation Simão Zanardi told Reuters. Brazil’s Petrobras has reportedly begun laying off engineering and construction contract workers at its refineries as the company struggles to raise capital amid record debt levels and a widening corruption scandal.